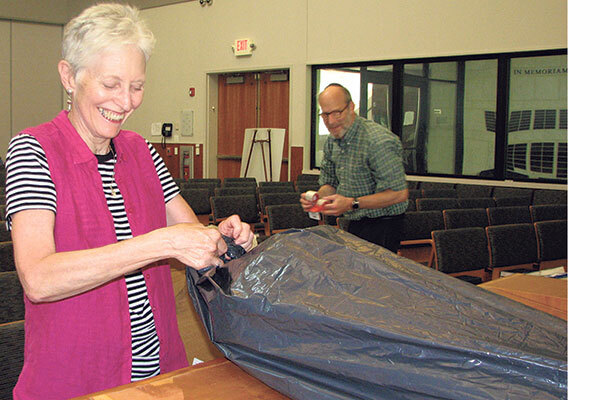 Inside the sanctuary at Congregation B’nai Israel, Rabbi Ruth Gais and Rabbi John Schechter pack the Torah scroll for transport to Poland. On Aug. 24, Rabbi John Schechter and Rabbi Ruth Gais packed a Torah scroll dressed in its blue silk covering in one large box and its ornaments — a carved wooden breastplate and rimonim with a matching wooden yad — in another, along with a second white mantle for the High Holy Days. When they had finished readying the scroll for its overseas trip, the two rabbis selected an appropriate Psalm to send the scroll on its way, and then placed it in Gais’s car. This is the story of the journey of one Torah scroll: from post-Holocaust Europe to Israel, where it was restored for a fledgling congregation in New Jersey, to a second community in the state for safe-keeping, and now, seven decades after the war, back to the future — to a new congregation in Gdansk, in northern Poland. This scroll survived not under glass, a relic for a museum, but as a living text that has nourished Jewish life across several denominations. “Receiving such a great and precious gift is very important to our community,” said Kasia Mazurkiewicz, who helped found the Gdansk congregation, Beit Trojmiasto, four years ago. Until now, the synagogue has been using a small traveling Torah scroll. Mazurkiewicz met the scroll at the airport in Warsaw on Aug. 31 and brought it from there to Gdansk. The scroll was used for about a decade by Chavurat Lamdeinu, a small independent havura founded by Gais in 2003 that met in the Masonic Lodge in Madison until 2014. 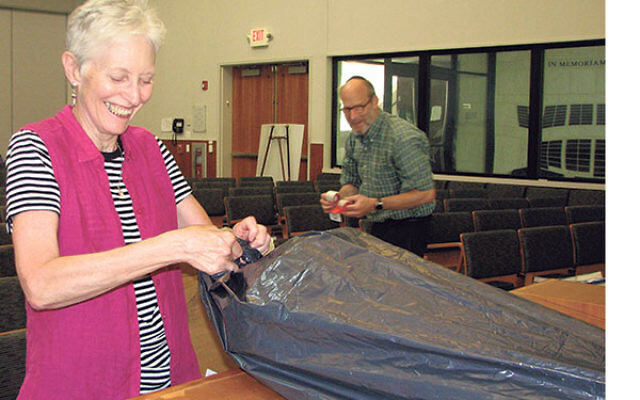 That’s when the group moved into space at Congregation Ohr Shalom: the Summit JCC, obviating the need for the scroll, which then took up temporary residence in the ark at Congregation B’nai Israel in Basking Ridge, where Schechter is the rabbi. Russell Jayne said he was thrilled to learn about the choice of the scroll’s newest home. It was Jayne, originally of Boonton and now the cantor at Congregation Beth Tzedec in Calgary, Canada, who funded and arranged for preparation of the scroll for Chavurat Lamdeinu shortly after its founding. A member since the havura’s inception, he acquired the scroll so the group would have a second Torah, a common practice designed to avoid too much wear and tear on a single scroll. “I was honored to help the little havura group feel more established, to function like a real congregation as it got together to study and for prayer,” said Jayne in a phone interview. And now, he has gladly endorsed the scroll’s being sent to the congregation in Gdansk. “I’m so honored that the Torah is going back to Europe, where it came from. If we can make another synagogue feel more secure and stable, that’s an honor,” he said. Not much is known about the Torah’s provenance, according to Jayne, except that it was rescued after the Holocaust from a synagogue basement somewhere in Europe and brought to Israel. It sustained some water damage — which can still be seen on the parchment in Deuteronomy — but Jayne had a scribe restore the text to kosher status before having it sent to New Jersey. Jayne also commissioned the wooden ornaments from synagogue furniture and ritual item designer Gabriel Bass, along with the silk Torah cover from American fabric artist Adrienne Yorinks. It was Gais who stumbled over the request for a Torah scroll for Beit Trojmiasto. She recalls thinking, “Aha! We have a Torah!” she told NJ Jewish News.